Dingboche, a long way down ! Dingboche was the point where we no longer saw greenery. 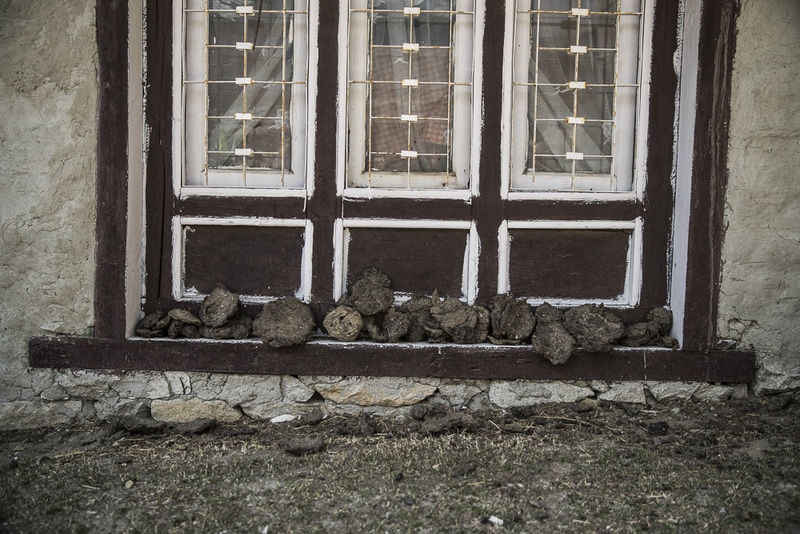 Instead, the village was defined with low rocky walls and small fields where grass struggled to grow. Yaks wandered aimlessly from one patch of earth to another to eke out a meal whilst the snowy mountains bore down on us from every angle. The village clung to the valley with a blisteringly cold wind whistling through permanently. The entrance in runs along the river which crashes its freezing waters over boulders and rocks below. 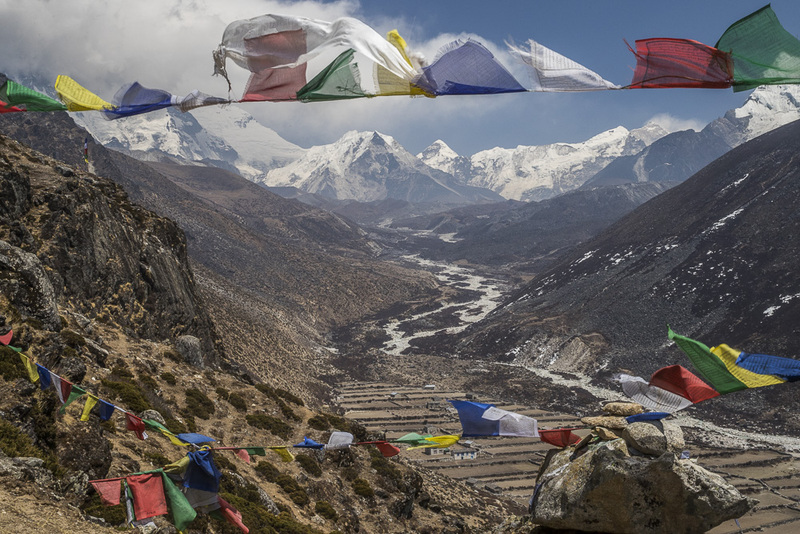 The wide mountain plains, reminiscent of Scotland, roll ahead and finally funnel everyone to Dingboche, its low rise guesthouses and two bakeries welcoming the weary trekker with their warmth. 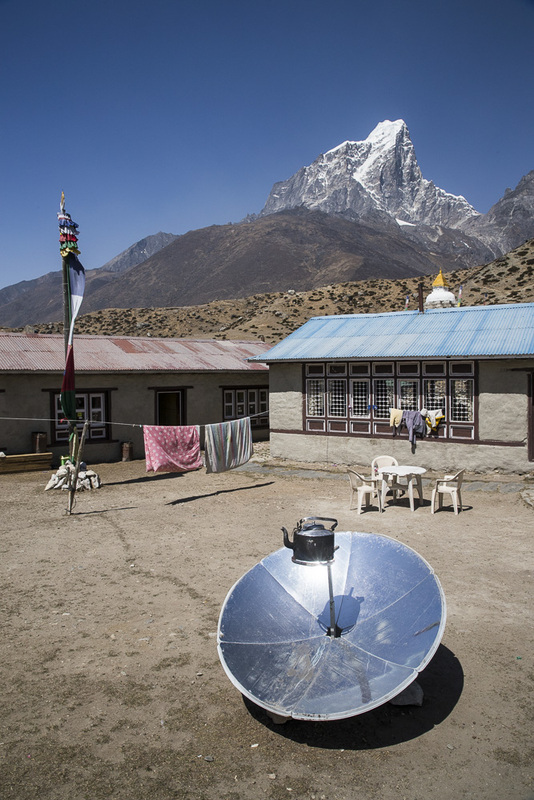 We settled into the Dingboche guesthouse at the entrance of the village with its solar powered water heater and baby yak in the courtyard. 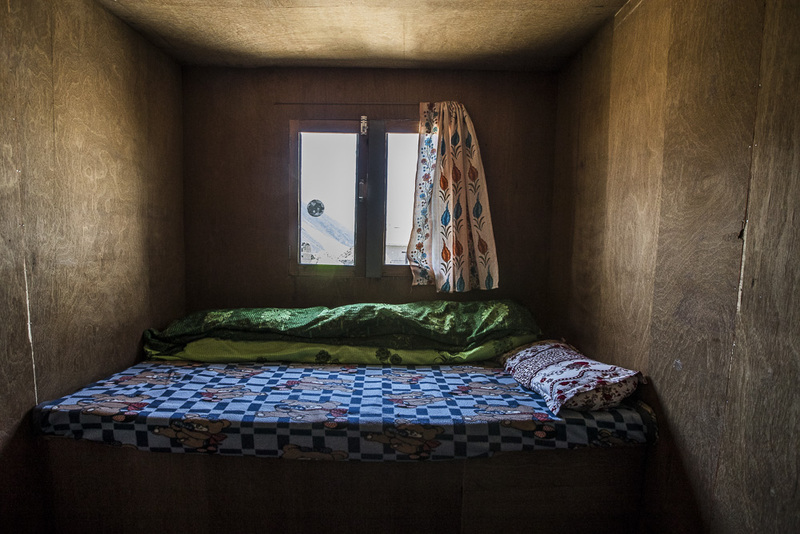 The room was small but cosy and had the added benefit of offering unlimited blankets to keep warm. After a day’s trek, we thought to clean our socks which had taken on an interesting scent. Cleaning them in the freezing mountain water, we hung them in the afternoon sun only for them to freeze solid minutes later! 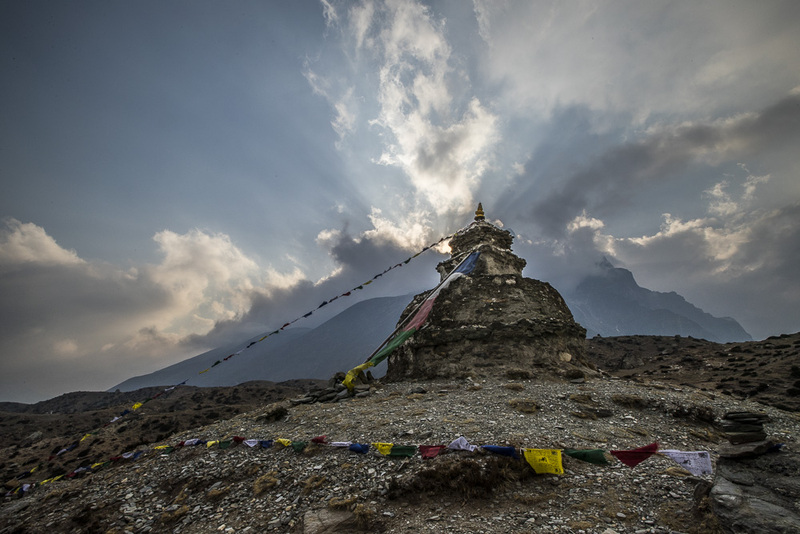 This was to be our acclimatisation stop, to trek to 5000-5100m for the day and then sleep back at Dingboche (4410m). It helps to cope with the change in altitude and to prepare against altitude sickness to have a plan like this. In fact, it was a method pioneered by the Everest summit attempt lead by George Mallory. 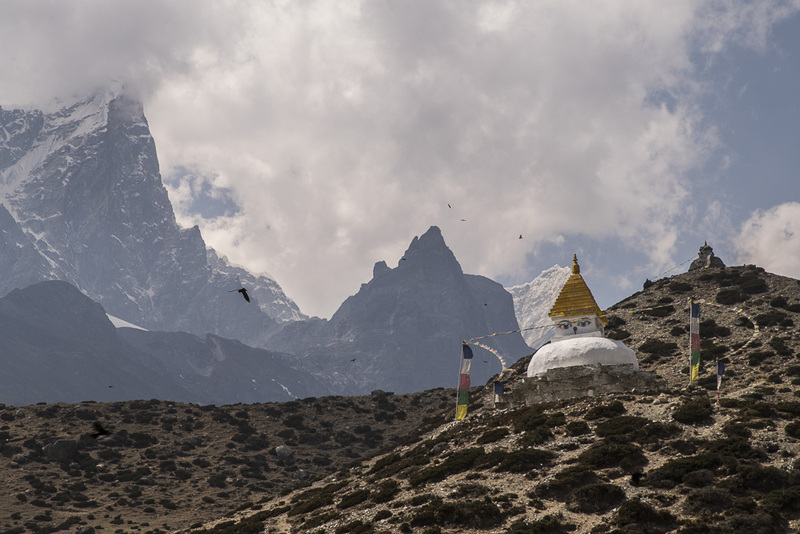 The mountain separating Dingboche from its neighbour, Periche, is a convenient acclimitisation point at 5100m with a stupa and chortens to mark your ascent at the top. We clambered up through a freezing wind which cut through all the layers of clothing we’d worn. 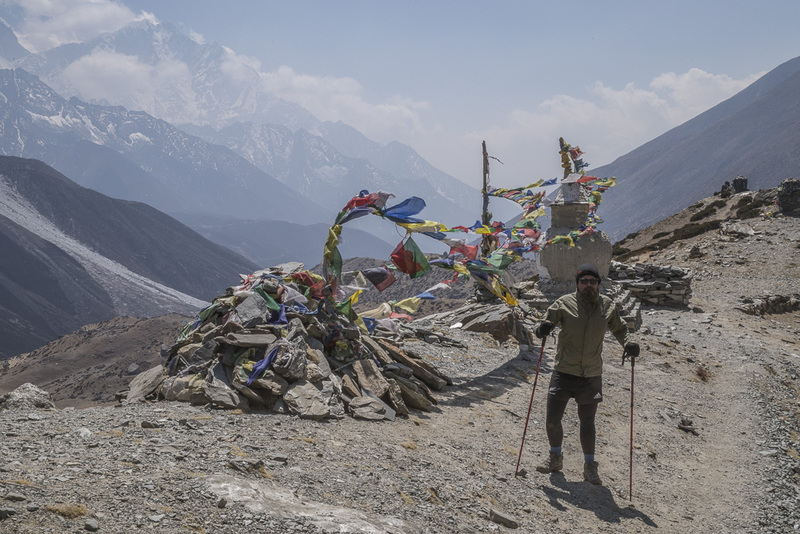 Nevertheless, we made it to the 5000m mark and admired the chortens placed at the crest with their colourful prayer flags and incredible views. The freezing wind snatched the breath from our lungs but the clear view was worth it with an unobstructed view of the valley to the clouds beyond. Alex was harbouring a cold picked up at some point the previous days and the cold wind was painful to breathe in. The longer we spent at the crest, the worse she felt with the beginnings of altitude sickness beginning to show. Every step was more and more laboured, with small rocks causing embarrassing trips and slips. Once the sun began to melt towards the horizon, the temperature dropped even more and it was unbearable to stand still when not in the sun as the cold would settle on the skin and try to claim it for itself. 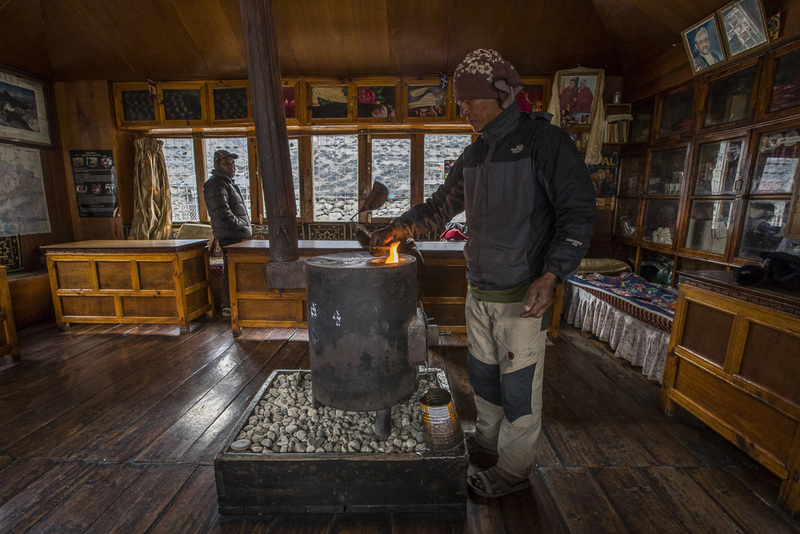 We walked back to Dingboche and hurried into the living room of the guesthouse to warm back up. The fire had been lit and the slightly acrid smell of burning dung permeated the room. Nonetheless, it was warm and meant we could finally dry our frozen socks by the stove. The guesthouse had two little sons who were on a break from school and they entertained us with their sketches of the guests which they drew with honesty and crayons. Once we’d thawed, we had an early dinner of potatoes, cheese and a side of pakoras. 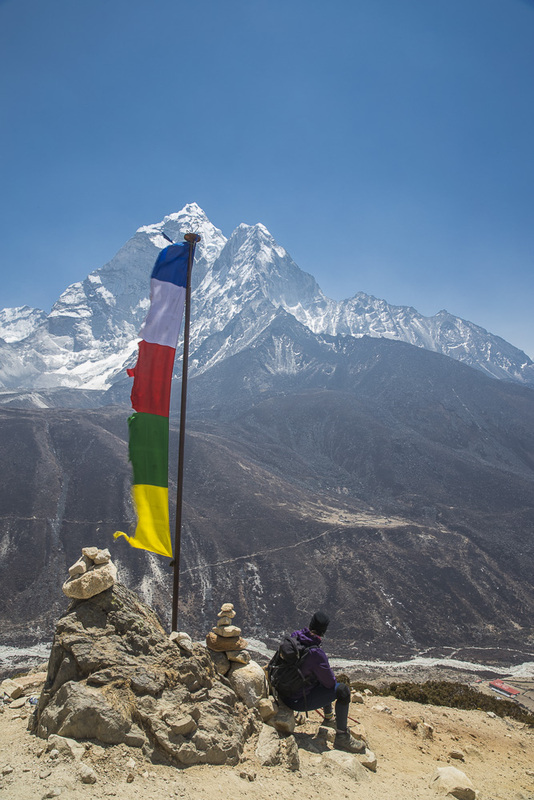 We met an Australian who’s trekked for the best part of 3 weeks and was returning from EBC. He said it was the coldest he’d ever been and he was looking forward to warmer climes. We’d been cold already and hadn’t yet reached the snowline. At 8pm it was time for bed as we had a big day the next day reaching Lobouche, then Gorak Shep before visiting EBC for the day and Kala Patthar. Smelling of burning yak dung, we retired to our cabin, braving the full moon and freezing air between the buildings. Sleeping with our clothes on, under 3 blankets, we finally felt warm enough to fall asleep, Simon dreaming of Everest, and Alex of the cold. In the morning, we woke at 6 ready to start our trek. Alex’s face had swollen so much that facial expressions were difficult. Her cough had deteriorated and generally, life was bad at that point. We decided that once we’d sat down to breakfast and Alex discovered a total loss of appetite that perhaps she was a victim of AMS and shouldn’t risk carrying on. Particularly as the cold manifesting the day before had now become a growling cough which accompanied a headache with every explosion. 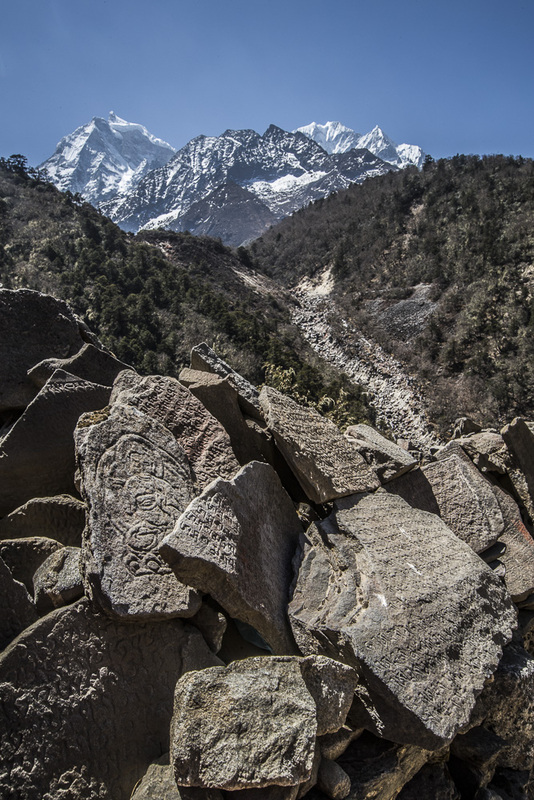 Deciding that the trek was over for Alex, Simon accompanied her back to Namche Bazaar. The way down was easier than the way up and by Tengboche Alex was feeling a little better. 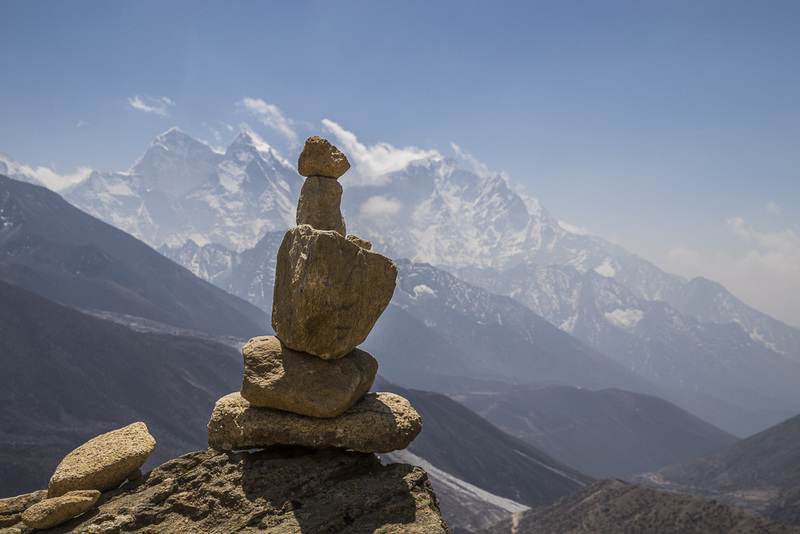 By the time they reached Namche she was only a little tired but glad that the headaches at least were done. 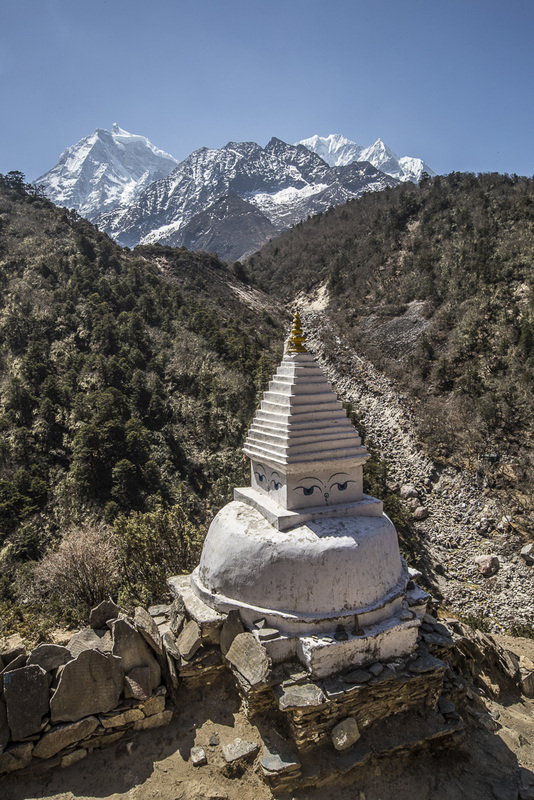 All which remained of the cold was the infamous Khumbu cough which stubbornly laces the throat and lungs until you leave the area completely. After one night of recuperation, Simon set off on his own, trekking to EBC with a heavier bag (now that we had to combine backpacks) and for the first time without Alex by his side since Mexico. Perhaps adding to the spirituality of the journey and making it more of a pilgrimage than a simple trek. 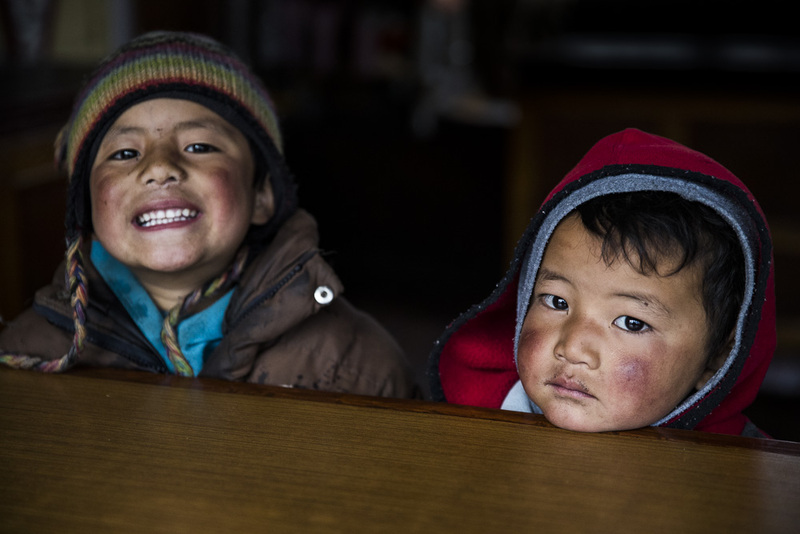 Alex was to wait in Namche for 10 days for his round trip and recuperate. 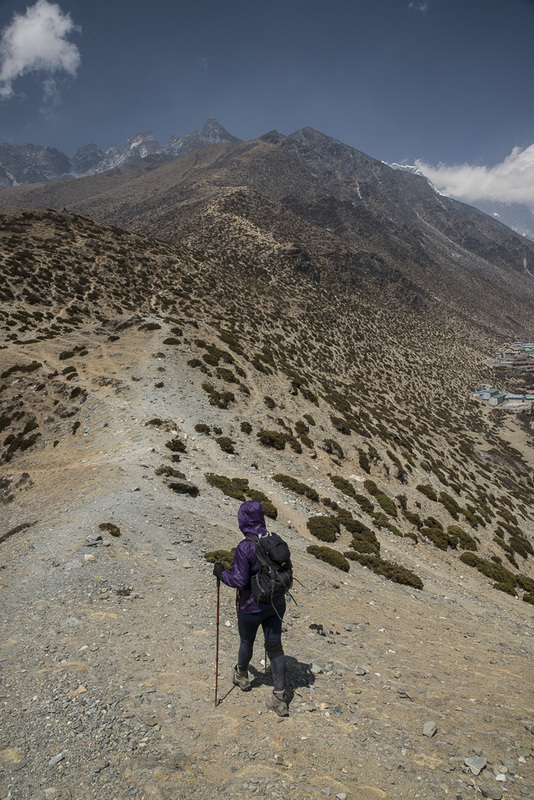 She had to admit it was a far harder challenge than anticipated- fitness or age have little to do with resistance to altitude sickness; it can strike athletes and the professional climber alike. At least at 3400m, the symptoms disappeared completely so it was an easy rest.